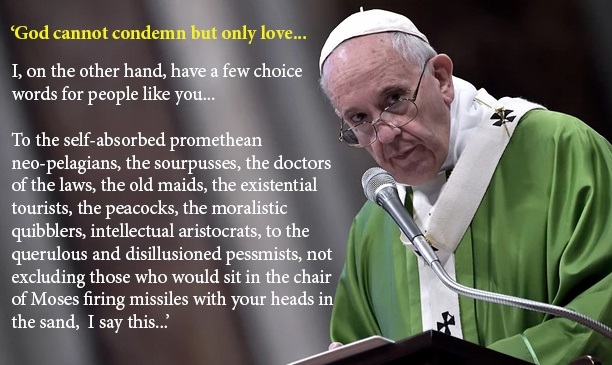 Ah, what a riddle we have in our Pope. Now that we understand that the 'Kasper proposal' will, in fact, be Bergoglio Boomerang, perhaps you can help me figure this one out...or have I figured it out? 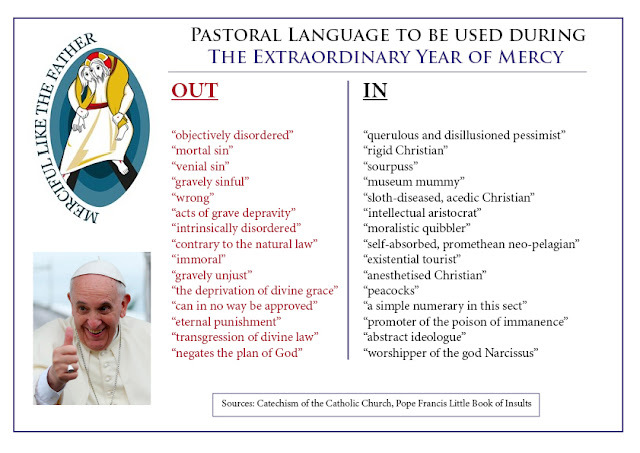 While touting 'doctrinal (let's throw in liturgical...pastoral...etc...) authority devolution' to create a loose federation of faith-in-humanity-so-come-and-do-as-you-please enclaves, which will be barely recognised as 'Catholic', pray tell why is Pope Francis, at the same time courting the Evangelicals and other denominations? I even wonder if some of them may know of what is afoot. By John Vennari During the 2015 Ordinary Synod, we've heard discussion of the possiblity of "regionalism," that is, allowing national bishops conferences to decide diverse "pastoral policies" regarding the Eucharist for the divorced and civiliy remarried, cohabitation and even homosexuality. 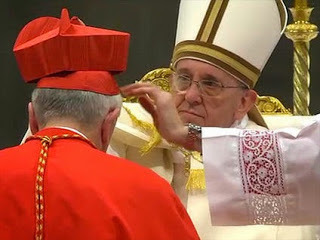 In an October 15 interview, Raymond Cardinal Burke rightly said that the proposed "regional diversity" is " simply contrary to Catholic Faith and life. " Yet Pope Francis himself in an October 17 speech brandished his resolve to "decentralize" the Church, even if he has to impose this decentralization from the top down, which would be a perfiduous abuse of authority. This un-Catholic "regionalism" and de-centralization did not appear suddently at the Synod, it has a history. Crown Him with many thorns, why not? Scourge Him with many whips, why not? Crucify Him again, why not? As long as you can take time out to talk about aliens and stuff, that's the main thing. This is not a bad choice of battle cry. Let us also pray it for the Polish Bishops. Bogurodzica ("Mother of God") is a Polish Catholic hymn dating back to between the 10th and 13th centuries which has since then been sung in battle or facing an oppressor. It is sung in times of peace, too, to commemorate those times when the Blessed Virgin Mary has protected the country of which she remains the only Queen. Virgin, Mother of God, God-famed Mary! Ask Thy Son, our Lord, God-named Mary, To have mercy upon us and hand it over to us! Kyrie eleison! Son of God, for Thy Baptist's sake, Hear the voices, fulfill the pleas we make! Listen to the prayer we say, For what we ask, give us today: Life on earth free of vice; After life: paradise! 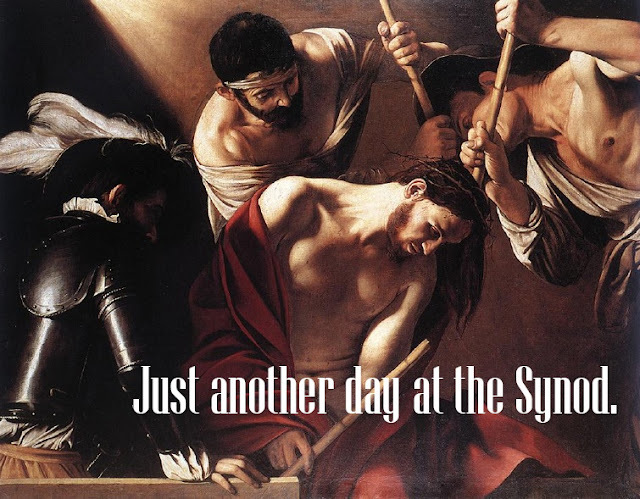 Kyrie eleison! What Happened to the Westminster Cathedral's Homeless? I was outside Westminster Cathedral today and talked with two guys from Victoria BID, that's (Business Improvement District) Board. They wore purple t-shirts and arrived in a white van to take away some tables and chairs outside in the piazza. I was wondering why there were so few homeless people around the Cathedral as there used to be. Suddenly, I put two and two together and made four. So I asked the guys from Victoria BID whether they were responsible for ensuring homeless people were 'moved on'. "Yes," they said, "we are like security for the area. We clean the streets around the piazza and make sure homeless people aren't around. These houses around here are worth millions, you know. 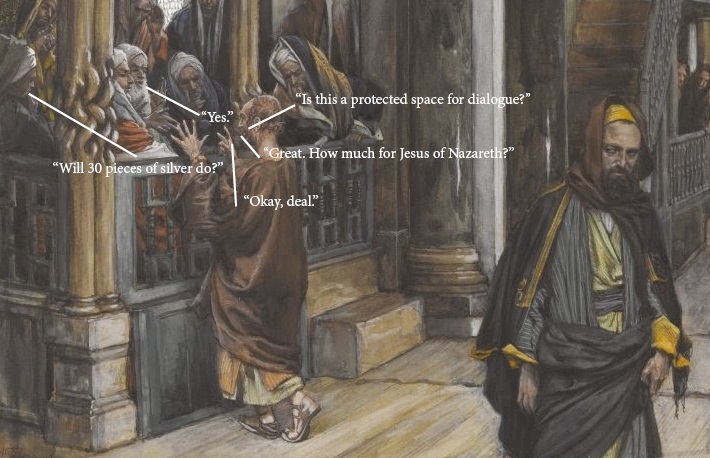 There's a lot of money around here." "So, is it the Council doing this?"